Last year, Sony shipped 71% less headsets than expected, causing an uproar of confusion, disappointment, and doom for the VR market. But in just one quarter, the PSVR managed to ship more units than the HTC VIVE and Oculus Rift did in an entire year -- combined (745K units vs 664K). 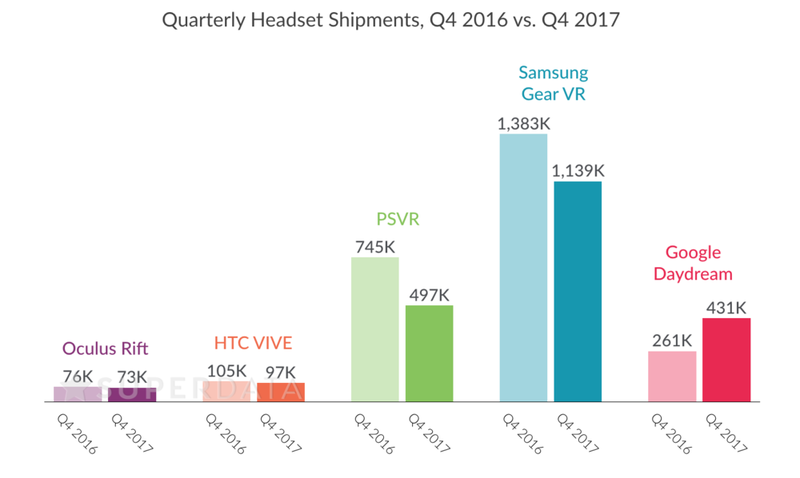 If that is the threshold for the gap of disappointment, this holiday season will plunge us even deeper below since every major headset (besides the Google Daydream) will ship less units than they did last Q4. The number of PC and console headset shipments in 2017 will reach just a third of expectations at the beginning of the year (1.6M vs. 6.0M). If 2017 brought us more VR content, lower hardware prices, and higher consumer awareness, why will this holiday season continue the lackluster sales we saw all year? 1. Marketing continues to be VR's biggest failure. Headscratching marketing initiatives (or lack thereof) have been a major reason why headsets are still considered a niche product. Gear VR is the only headset to proactively use product placement and traditional ads to get the word out. It seems the OEMs are mostly relying on content and word of mouth to attract new users, but there's no killer app, big IP, or critical mass. Even price cuts aren't enough since the cost is still prohibitively high for most consumers. Likewise, the inability to agree on terminology is hurting the industry. It seems Microsoft decided to go rogue and call their VR headsets 'mixed reality' in what seems to be an attempt to position itself as a superior to its competitors. This is the same term they use to describe the wildly different experience you get from their Hololens headset, which makes it seem like their internal marketing teams are either confused or refuse to talk to each other. And that's after they floated around Windows Holographic to describe their headsets, as though holograms are in any way part of the VR ecosystem (if this all seems confusing to you, Charlie Fink claims you're not alone). Without a clear, cohesive message (and in many instances, with a message at all) VR will fail to entice apathetic consumers. 2. Sony will ship half-a-million PSVRs this quarter -- a 33% less than they did a year ago. Although holiday shipments will be two-thirds what it was last year, PSVRs are selling at almost twice the speed of PC headsets. One of its biggest strengths has always been the PlayStation 4's 65 million installs, which is more than twice the number of PCs in the world capable of running fully immersive VR. PS4s are a consumer product, but a share of those 30 million PCs are for business use, cutting down the addressable audience for HTC VIVE, Oculus and Microsoft. Console sales are also more hit-driven than PC: console gamers are less inclined to play indie games and rely more on recognizable IP and AAA titles. This is one way PSVR has had an edge on PC headsets since they have been able to leverage franchises like Resident Evil, Batman, and Skyrim. But this also hurts PSVR since the line-up for non-VR Playstation games is particularly impressive this year, pulling gamers' timeshare away from immersive titles. 3. Skyrim VR may be PSVR's killer app, but the market still suffers from a lack of big IP. Skyrim VR launched November 17 -- a week before Black Friday. The game has earned the highest user metascore of any PSVR game, right in time for holiday shopping. This is one of the first instances where a game is directly responsible for boosting headset sales: The Skyrim VR bundle, which includes the game and a PSVR headset, is currently the best-selling VR product on Amazon. Skyrim VR is currently exclusive to PSVR, but we can also expect other key franchises from Bethesda like Doom VFR and Fallout 4 to push adoption across all high-end headsets. But you can count successful VR games with recognizable franchises on two hands. It's the famous chicken-and-egg situation where if headsets aren't selling, publishers aren't investing, but without big titles consumers, aren't going to buy in. Thankfully Bethesda has decided to blaze the trail, but until other AAAs follow suit, adoption rates will remain lackluster. 4. Google lost its standalone, and is now losing the VR race. Google in particular has suffered from terrible marketing. The Google Pixel wasn't an enormous success, so the company has thrown its weight behind the Pixel 2. They've also aggressively focused on edging out competitor Amazon with their IoT products, turning Daydream into the runt of the litter. Instead of taking a cue from Samsung and giving Daydream's out for free with Pixel 2 preorders (which sold out), Google is doing nothing to push adoption besides a measly $20 price cut for Black Friday. But it's not because Google doesn't care about or believe in the Daydream (especially considering they've put millions into content for it). The Daydream, as with the Cardboard to an extent, was a proof of concept device. They know tethered devices aren't going to create mass market adoption. I'd bet they've had their eyes on a standalone for years but needed a manufacturer like HTC or Lenovo to make it. And since HTC is making their own standalone, the HTC VIVE Focus, and Lenovo has fallen off the radar, it looks like Google needs to restrategize -- fast. With Oculus GO, VIVE's standalone and even Apple's ARKit, Google is currently losing the XR race on all fronts. Even with headset discounts, bundles, increased supply, and great Microsoft contenders, VR is still not what most consider “successful”. But one thing’s for sure: VR usage is increasing. In fact, the global install base (not including Google Cardboard) will grow 71% since last year to 24M. So the truth is VR is winning, but as we approach 2018 the industry will need to make some new year’s resolutions: More content, better marketing, and some great standalones.